Released at the end of 2013, the Sony IMX174 sensor seems to be on everybody’s lips these days. Just about every camera manufacturer includes it in their product portfolio. SVS-VISTEK has chosen to integrate it in the new EXO series (EXO 174). This should not be seen as an end in itself. Somewhat overshadowed by the Sony brands, Exmor and Pregius, there is a range of alternative CMOS sensors boasting excellent image quality. ON Semi has achieved a tremendous leap ahead with the Python series, a design evolved from the Vita series. At CMOSIS, the engineers and marketing strategists were not resting on their laurels either. OK, so what is Exmor and Pregius? Exmor is a registered trademark of Sony. 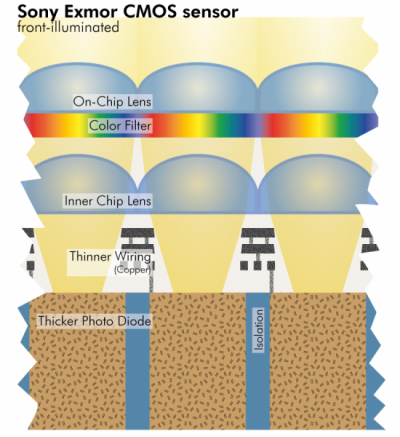 The Exmor brand represents a major innovation within CMOS architecture that in short can be described as having replaced aluminum with copper for chip interconnections. The cross-section diagram shows how it differs from ‘conventional’ designs. This, so Sony, contributes to the increased quantum efficiency of its sensors. Pregius is also a registered trademark of Sony. At a first glance, the name seems to read “prestigious”. A connotation well worthy of this new development in the sensor readout technology. The analog signal paths across the length of the chip to the A/D-converters represent a common noise source in CMOS sensors. Reducing both length and propagation time of the signal paths, the traditional single converter design has been replaced with a converter for every row in the sensor matrix (1920 x 1080 pixels = 1920 A/D converters). As further explained by Sony, the CMOS sensor is equipped with an analog memory for electric charge, inspired by the CCD architecture. This allows reading out every pixel twice, practically without external influence. With two differing values, the truth lies in between. This technique is known as Correlated Double Sampling (CDS), and can nowadays be found in all CMOS sensor manufacturers’ designs. There are, however, differences in how this is implemented in detail. The Belgian chip house has its very own design known as “Real Double Sampling”, whereby each pixel is sampled twice, without additional circuitry. The CMV4000, integrated in the EXO series, offers this solution. The Python sensor family features “in-pixel Correlated Double Sampling” (ipCDS). As the name alludes to, there is a structure within each pixel amplifier to perform the CDS. Two samples of the pixel charge value are averaged (correlated) before being converted to a voltage, and subsequently sent to the A/D converter. Improving signal to noise ratio is most certainly a major driving force. Additionally, machine vision applications demand another important feature; the global shutter. It comes at a price, though; namely the irregular readout behavior inherent to CMOS architecture. Whereas a rolling shutter continuously delivers values to the A/D converter, in the global shutter architecture the charge and voltages are retained in the pixel until their turn has come to be read out. During this time the signals exposed to additional noise build-up. This also explains why rolling shutter sensors are smaller, and typically exhibit higher sensitivity. 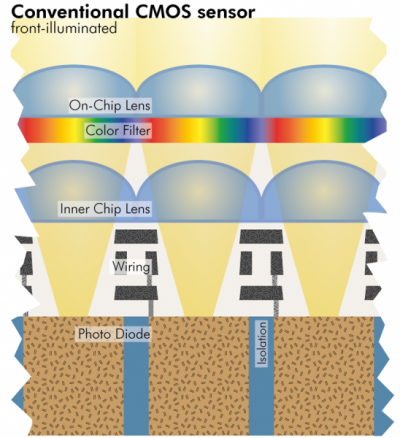 In the past year, chip manufacturers have succeeded in defeating noise to a high degree in their global shutter sensors; Each manufacturer in their own unique fashion. Sony has come a long way with the IXM174. CMOSIS and ON Semi are not left far behind either. As a result, we have decided to package not only this sensor into the EXO series, but as our gift to you we provide a full range of sensors with a variety of technologies and resolutions (CMOS and CCD, 0.3 through 12 MP). It doesn’t get much better than this. Top quality made in Germany - Scalable to your application.